Prepare and serve fresh pizza, signature soups, or artisanal flatbreads with this 4 oz. flat bottom ladle! This ladle features a flat bottom bowl and durable one-piece stainless steel construction. It's easy to clean, and durable, too! With this ladle, you'll be able to measure, prepare, and serve your delicious dishes. Use it as an alternative to measuring cups, spoons, or spatulas. It's perfect for a variety of tasks when it comes to making pizza, flatbread, soups, and sauces. these ladles really do help spread the sauce over the door more evenly and help save money, we use this 4 oz for Small and medium pizzas. These ladles have worked out very nicely for our busy pizzeria, so we're ordering more for a new location. Good quality build, especially for the price, so you can't go wrong with these. Also good for portion control with your sauces. For medium pizzas works very well, the perfect amount of salsa and helps you to spred, i think is the one item you need to have always the same quality!! This is a great ladle for sauces on the steam table. We have purchased in different sizes and use this one for pizza sauce. The flat bottom is great for spreading sauce on dough. This four ounce flat bottom stainless steel ladle was exactly as I expected. The weight is great for stainless steel and feels solid. I have not noticed any sign of wear at the neck of the spoons as other reviews have described. Very durable and I would recommend to anyone but I would like to see additional styles offered. And a special thanks to customer service for the sincere recommendations. Perfect ladle for portioning sauce. I use the ladle for pizzas, flat breads, garlic breads, and some baked goods. The flat underside makes spreading quick and efficient saving time and mess. If you are looking for a very reasonably priced flat bottomed ladle this is a great option. This ladle features a 4oz capacity and a flat bottom which makes it easy to spread sauce onto pizza dough. These ladles can also be used for soups and stocks. Very easy to clean up too. The 4 oz. Flat Bottom Ladle has a nice look and feel. It is great for proportioning pizza sauce but has many other uses. It is sturdy and easy to clean. I originally got this to use for spreading pizza sauce on a pizza. But I found that I prefer the round bottom to the flat bottom. 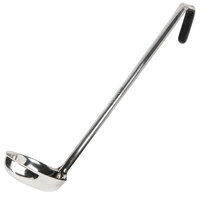 With that said, this is a well built ladle. It is light and feels on the cheaper side. Size is great for saucing large pizzas but handle is not comfortable at all to work with. Sharp edge cuts into hand. Actually took a torch and bent the angle of the handle to make it work better. Like the flat bottom but with the handle was designed better. this 2 pieces little flat bottom ladle looks nice , has good built quality , easy to use and clean , my chiefs like it . This 4 oz. Flat Bottom Ladle is the perfect utensil to serve your soups and stews...very nice to use at a buffet line of simply serve your family at home. Very nice ladle. Great flat ladle, very sturdy,perfect size for spreading sauce on pizza Also works great for spreading on lasagna going to the order the other sizes. This spoon works well for soups, sauces, and gravies. Even though I got it for soup I intend to use it for multiple things. I can't wait to try it! These laddles are very good quality made of fine steel. They will be used to scoop meatballs from the sauce foe an upcoming spagetti dinner. They are perfectly constructed and will last a very long time. Buffet portions are important and this ladle makes life easier as you'll be able to serve the same amount to every guest and is certain to save you money and time. I think after buying this I prefer normal ladles, but this one is made well, and I really like the hooked handle. Good for things like sauces. WEBstaurantStore has a great inventory of stainless steel ladle s and the 4 oz flat bottom ladle is another one that I absolutely love it is used in my kitchen constantly. This is a great little used for making pizzas we like it because it's a portion size that is perfect and has the flatbottom to spread the sauce I recommend you buy multiples. Love the flat bottoms. They sit in the kettles without slipping around. Easy to scoop out most of the product without tipping. Just the right size for portion control. Well made ladle. I like the one piece construction and the shine is good. Flat bottom makes for easy reaching down into the bottoms of sauces. I bought two of these flat bottom ladles for our pizza shop. They are just the right size for measuring as well as spreading the sauce on the pizza. Perfect piece! Just what the Chef ordered, Great Construction, heavy, portion controled, everything we were looking for in this ladle. Couldn't have asked for a better product! These ladles are a great size and very sturdy. Handle size on these are a plus, no worries of losing it in you pot of soup. This ladle is the perfect supplement for our soup chafer we also bought from Webrestaurant. And the 4-ounce size is also great for ladling out the perfect serving. Good ladle for distributing pasta sauce or placing and spreading sauce on pizzas. Wish the handle was a little shorter, but still a good ladle to have. I bought this ladle solely for spreading pizza sauce after seeing one used on a youtube video. It really makes things easier for getting a nice round spread of the sauce onto the dough. I'm just a home pizza maker but for this price, it's hard to go wrong. The metal is a little thin so I'd get a more heavy duty model if you'll use it every day. We use the 4 oz. Flat Bottom Ladle to spread the pizza sauce on the dough. It is a great item for the price. we love it. Keeps control of your food cost by knowing how many you need to make so that your food cost is the cheapest as possible. You always want to make more money. This is a great ladle that is built to last! The flat bottom design is great for skimming the fat off off a sauce or stock!! We have four of these in our restaurant. I use them for soups, chowders, almost everything. The size is perfect, and the price as well. Good construction, and looks great. grat size we use these for pan cake and , crep . it works really good. the portion is pefect. we also use them for soups as well.